Passive Mews II follows five years after we completed another certified Passivhaus a few doors down. From the outside, the mews stands proud, perfectly proportioned and subtly detailed, in a way that differentiates it from the other London stock houses on the street, yet without being too bolshie. What is not evident from first glance though, it what lies behind the skin. 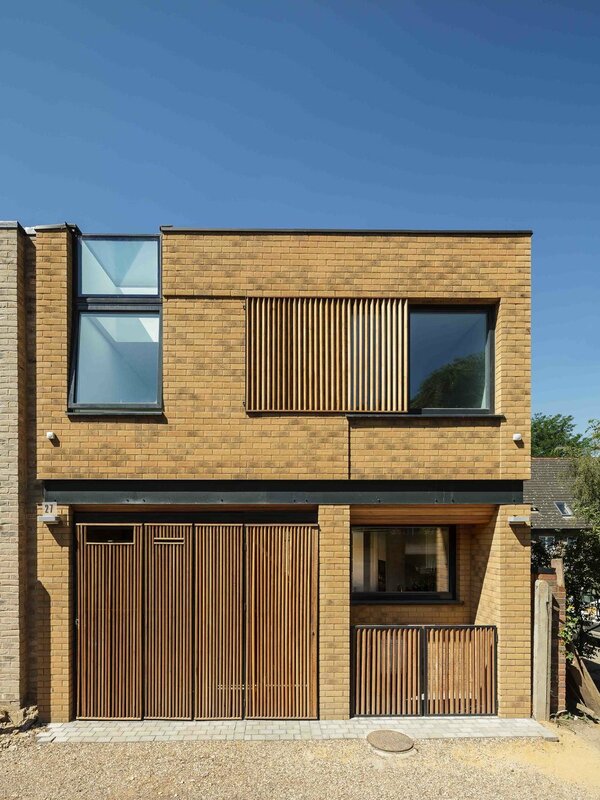 The house is a certified Passivhaus, one of a growing number in the UK that are designed to arguably the highest levels of energy efficiency around. The Passivhaus standard is the superior mark of energy efficient buildings and follows a set of principles which utilise energy from the sun, superinsulation, airtightness and a ventilation system to create healthy, comfortable, low energy buildings, often without any central heating. To help achieve this, we have taken an offsite structural system that alone would offer excellent thermal performance, and wrapped it in more insulation, before fitting triple glazed windows and doors. Combined with a mechanical ventilation and heat recovery system, the architects predict this will consume around 90% less energy than a typical build. The overall design concept plays on the industrial service nature of the mews lane, maintaining a subservient presence to the townhouses behind it. The elevations use a combination of brick and steel that are softened with red cedar detailing. Chamfered timber soffits and slight variances in the brick depth bring lightness to the elevations that are animated with sun and shadow. Light plays an important role in this house; every room is flooded with it. Not only does this enhance the internal living spaces, it making them feel more spacious and luxurious. The light bounces off the clean and simple internal material palette, defined by sharp clean lines, flush skirting boards and shadow gaps. 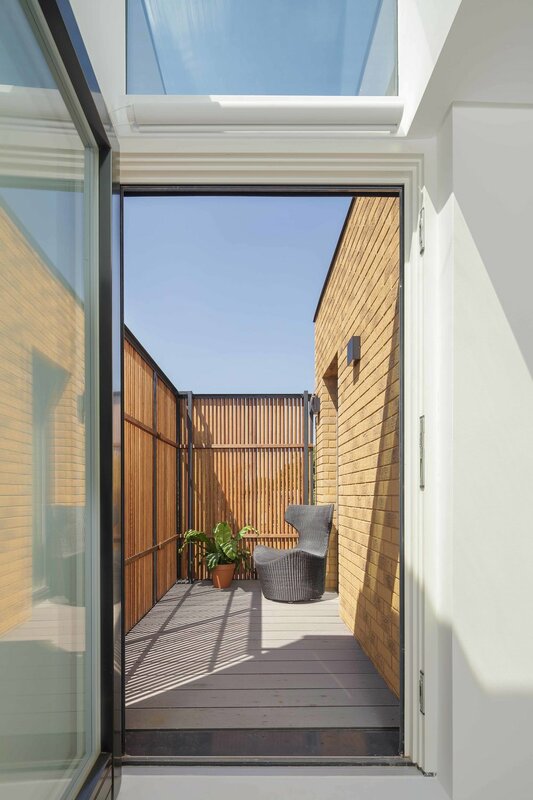 Maximising the outdoor amenity, the house offers a rear courtyard and a first-floor terrace, accessed off the master bedroom, which provides a more sheltered and private outdoor space. 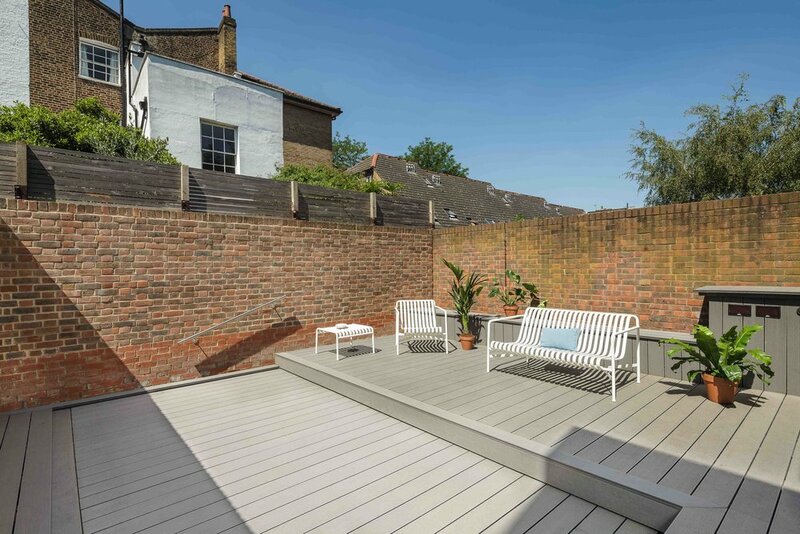 Standing in the courtyard, one flick of a switch starts to move the timber deck, which slides open to reveal a compact swimming pool underneath. The pool is electrically operated, which whilst is a significant consumer of energy, is almost completely offset by four large photovoltaic panels on the roof. Heating the pool, however is an additional cost outwith normal running costs. The road to completion was not the easiest for the team working on it, namely due to working with a contractor who was declared insolvent half way through construction. In a twist of good luck, the client’s son stepped in to help, forming a new construction company to complete the house. The house has come to represent a triumph over adversity for the team and required a huge effort and close collaboration between the architects, client and her son. Not only this, but it stands to prove that the super-eco home can look as slick as the next, without compromising details and luxury.